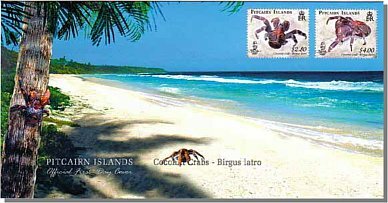 Found on Henderson Island and possibly on Oeno and Ducie, the Coconut Crab Birgus latro is a fascinating creature. It has an extremely drawn out life cycle which causes the species to re-populate slowly. 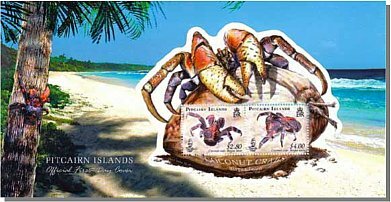 Phase one sees the female crabs travel to the coast to spawn. Four to five larval stages follow, taking 28 days in the ocean, after which the developing crab spends a further 28 days on the ocean floor. The next stage is to come ashore and find an empty shell to hide in. They remain in this temporary housing for 1-2 years and then travel inland where they tunnel underground to a depth of 50mm. In yet another home, the exoskeleton becomes brittle and is discarded and the crab becomes immobile. The crab then eats its old shell to re-absorb minerals while a new shell develops over a 4-week period. The crab can then finally leave its burrow but reproduction cannot occur until they mature further between 3.5 and 5 years later. This enormous crab which can weigh nearly 9 pounds and live 60 years, has developed much to adapt to its conditions: climbing skills to fetch food from tree tops; digging skills to burrow underground and into tree trunks to hide; gills to survive in water, and ability to drink a little saltwater to maintain its body salt. They are mostly herbivorous feeding mainly on dry coconut flesh (by cracking open coconut shells with their powerful claws), dead fruits and leaves but have also been observed eating dead animal carcasses. The Pacific crab population has declined throughout its developmental range due to habitat depletion, being collected for food and from introduced animal enemies such as pigs. 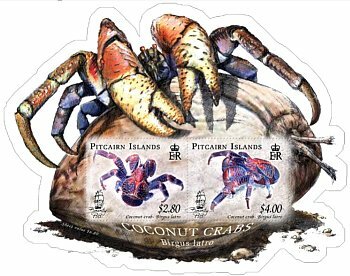 With rapidly declining Coconut Crab numbers, many Pacific countries have implemented bans on the collection of the world’s largest crustacean. The slow life cycle has resulted in laws aimed at protecting females of egg-bearing age. Mini Sheet Size: 110mm x 85mm (Stamp Size (33.00mm x 26.00mm). Format: 2 panes of 25 stamps with central gutter plus two stamps in a miniature sheet. Paper: 104gsm Y/G phosphor gummed paper. 17 February 2009 for a period of 2 years.